Seductive Interaction Design, by Stephen P. Anderson, is a pretty good book on Interaction Design, both for designers and non-designers. Anderson shows lots of real life examples and explains everything clearly, in a pleasant conversational style. It also helps you understand how design influences the human behavior, and the psychology behind it. The book is really fun to read and the concepts you will learn are very useful if you want to create better products. If you’re really interested in Interaction Design or you want to get introduced to it, this book will be a great buy. Aesthetics examines our response to an object or phenomenon. Perceived affordances: cues that communicate how an user can and should interact with an object. Create natural references to relate objects to real life objects. Law of proximity: if two or more itens are placed in a cluster together, people assume they’re related. Things that are enjoyable will be perceived as easy to use and efficient. Products have a personality, and they bring expectations. How we think cannot be separated from how we feel. We make cognitive and emotional associations every time. Human perceptions are essential to the design process. Associations are suggested by different aesthetic cues. Aesthetics are concerned with how we perceive and interpret the world through our senses. Underdesigned stuff can make users feel a certain way about them. The context in which we are designing should influence the final visual aesthetics. A balance between innovation and novelty (advanced) and a certain amount of tipicality (acceptable) must be found. The introduction of human faces (like avatars) changes user behavior. Adding a bit of humour can make an interaction more human and engageable. If humour is appropriate in a real-world interaction, it’s appropriate online too. Emotional design can help improve the perception of the usability of an interface. The unexpected is exciting -> anxiety and curiosity. Unexpected things should enhance the control of the experience. Little changes makes interactions more human (e.g. changing success messages). Surprise may come in the form of variable rewards that may reinforce a particular behavior. Delighters are another kind of surprise whose intent is to bring joy (delight) to the user. Gifting is also known as reciprocity. We are all bound to repay debts of all kinds. An unexpected gift will surpass users expectatives and make them more loyal. Good gifts are personal (about the user) and unexpected. They’re meaningful/useful (not generic) and pleasantly packaged (well designed). Curiosity drives the pattern seeking behavior. Information presented in a curious manner guarantees more attention engagement. It’s human to pursue a mistery until it’s solved. People want to leave their personal marks on stuff. Look for opportunities to surface and celebrate your customers unique choices. Shape the path and change behavior: put things in simple terms, suggest a course of action, set up defaults, get a small initial commitment. Extra efforts results in lower completion rates. Sequencing: break tasks in small steps. When presented with more options, we’re far less likely to take any action at all. Try to make things visually simpler. People need to think less to increase conversion. Contrast is a good way to capture attention. People are mostly lazy. We tend to choose things that don’t require anything from us. We tend to go with the defaults. Use this positively (status quo bias). Personalized recommendations and suggestions can increase user engagement. Fear of loss (of any kind) affects decisions. A good choice of words changes opinions. Get personal: use ‘you’ in your writing. This will create more engagement, even if it’s more informal. Role-play the interaction: the user and the interface should have conversation-like interaction. Document every step of the experience. It’s better done in a narrative way. Break down compound requests into simple “next steps”. Minimize choices and actions a person has to make. Clicking is better than typing. Basic elements: points, levels and badges. The elements of game design: Play & Challenges, Conflicts & Choices, Feedback Loops, Goals & Rewards, Imaginary World. Make things challenging, but not too much. Game mechanics can be added, but only to something people already enjoy. Conflicts and choices are necessary for a good game. Scarcity (limited things) makes things more valuable. Character limiting can increase participation. Limited access makes things more desirable. Feedback loops are important because we like to know how our actions influence the world in some way - they cause a reaction. Personal informatics: tracking of personal data (people love statistics about themselves). Attaching a measure to anything turns it into a game. Through personal informatics or competitive scoreboards, we gain information to help us improve that area. Why people stick with serious: they do one thing very well and are continuously updated; it’s easy to use and reliable; my friends use it. 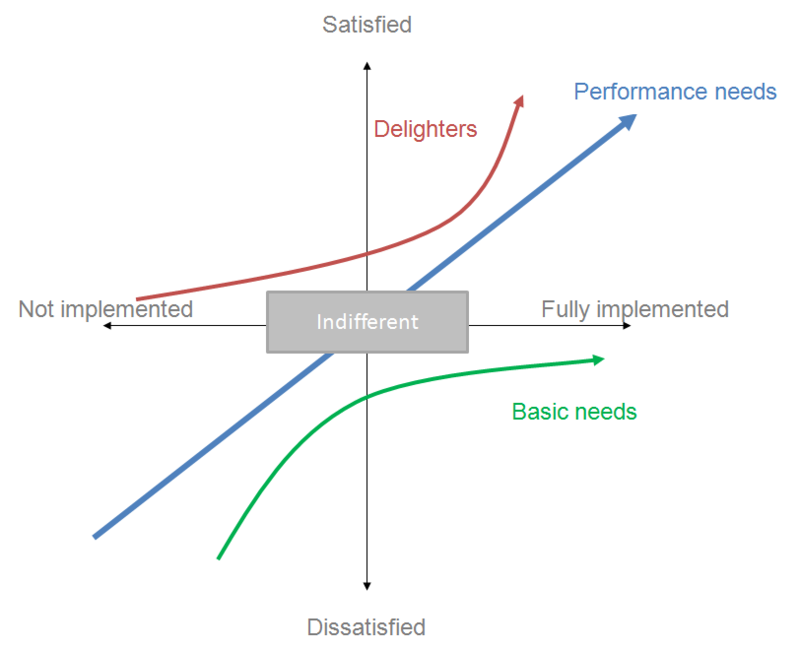 The Kano Model: it provides a way to evaluate and discuss customers basic needs, performance needs and exciters or delighters. Basic needs merely minimize dissatisfaction. People will notice if they are missing or implemented poorly. Companies tend to ignore them as more features are added. Design after knowing what the target behaviour is. When you have an identity, you know who you are and who you are not. A hallmark of a great company is that everyone knows the reason for their company existence. Social proof: we follow people we perceive as being similar to ourselver when in new or unfamiliar situations.